Jun. 16, 2010 · 3:42 a.m.
Jun. 4, 2010 · 4:57 p.m.
May. 28, 2010 · 6:53 p.m.
May. 24, 2010 · 5:44 p.m.
May. 21, 2010 · 5:12 p.m. The three properties located at 120, 122 and 124 West Michigan Avenue in downtown Ypsilanti will soon be rebuilt into commercial and office space and loft apartments, thanks to a planned $1.7 million investment by developers. Jun. 4, 2010 · 10:40 a.m.
Three recently-vacated properties in downtown Ypsilanti, two of them condemned, will soon be renovated owing to recent purchase by a local development company and a tax exemption granted the developers by City Council Tuesday night. 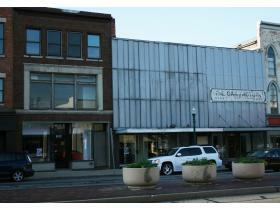 The three properties, at 120, 122 and 124 West Michigan Avenue, are easily identified in the center of Ypsilanti's downtown, two of the properties with steel siding on the upper facade. The tax exemption, approved with an unanimous vote by City Council, will freeze the property taxes for 12 years, allowing the developers to make improvements to the three buildings without increasing the value and, by doing so, increase the amount of tax they are required to pay. To do this, the City of Ypsilanti first created a special “Obsolete Property Rehabilitation Act” district encompassing the properties, then voted to approve the 12-year tax freeze, which will set the taxable value of the properties at approximately $182,079 for the period despite any improvements. Public hearings were held before Council considered each issue Tuesday, during which no individuals offered any comments or concerns. Ypsilanti City Planner Teresa Gillotti reported at the meeting that the value of the exemption, assuming the properties are developed as planned, would total about $740,000 over the 12-year period, taxes the city will now forgo with the exemption in place. The two properties at 120 and 122 West Michigan Avenue were condemned after an inspection last September. Ypsilanti's Downtown Development Authority, which will also lose out on potentially higher tax revenues owing to the exemption, recommended the approval of the special designation at its May 20 meeting. Maurer Management and Properties, a local property management company, purchased and combined the three properties as Mellencamp Building LLC in April and May and plans to invest approximately $1.7 million in the renovation. The projected improvements include taking the metal siding off the facade, adding a third floor to 120 and 122 West Michigan to accommodate 10-12 loft apartments in the upper stories of all three buildings. Three commercial spaces are proposed for the first floor, office space in the basement and an office or art studio in an annex across the alley behind 124 West Michigan. The properties are located in Ypsilanti's historic district and the Downtown Development Authority district. The developers are also applying for a 20 percent Michigan Business Tax credit and Historic Preservation Tax Credits. Eric and Karen Maurer, owners of Maurer Management and Properties and developers of the three buildings, answered questions Tuesday and explained what they planned to do during renovations. Eric Maurer said the loft apartments will be similar to other developments the company has worked on in Ypsilanti. The company also rents loft apartments at 128, 130, 200, and 213 West Michigan Avenue. Karen Maurer said they are somewhat concerned about finding renters to fill the three commercial spaces that will be available after renovations are complete, but has no doubt that the lofts will rent well. The name for the new project, Mellencamp Building, came from the name of the clothing store that did business in that location for 114 years, Maurer said. "As historic preservationists, we wanted it to live on," she said. The Maurers said they researched the former downtown Ypsilanti retail store at the library prior to investing in the project. Ypsilanti Mayor Paul Schreiber said he was happy to see the Maurers continuing to invest in the city's future by taking on the project. “One of the reasons we are having a renaissance downtown right now is the new people moving into loft apartments in the downtown area,” Schreiber said. The special tax exemption is contingent on the developers not being delinquent on any taxes and completing the planned renovations within two years. The only thing standing in the way of work to start on the building, according to the Maurers, is approval from the state's tax commission and final approval of loans for the project.